What do you do when you’re running low on inspiration? Do you sip a cup of tea, take a walk, paint, write a poem, cook something? Or do you freeze up, unable to create? Writing a book for the last several months has had an interesting effect on my brain-space. The book is incredibly daunting and takes all my creative juices. I find myself sopping through my house like a wrung out rag. I once read that we are only capable of making a certain number of decisions each day. After that time, we’re pretty much worthless. Sometimes, after a particularly long book writing session, I can’t even decide what pajamas I want to curl up in to decompress. Thankfully, the world is a resource. It’s a constant inspiration. Remember, even on those nights you’re too tired to pop popcorn, the world is there, whispering sweet nothings to you. Inviting you to try something different. And so here we are… today, Vanuatu is doing the whispering. Since I spent yesterday grating a mountain range of sweet potatoes, today I’m going to show you a shortcut to the flavors of Vanuatu. 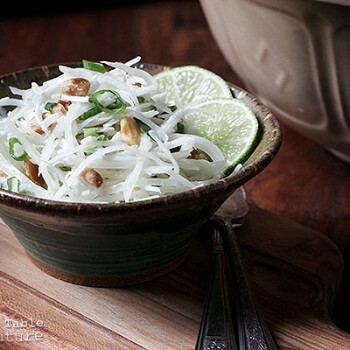 Green Papaya salad uses many of the most popular flavors in Vanuatu, most notably the grated coconut and the green papaya. 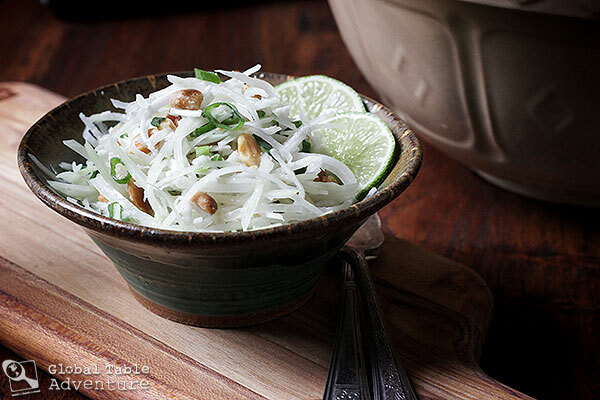 The peanuts and the fresh lime juice give the recipe a nice balance of flavor. A hit of hot chili pepper would be delicious, too. 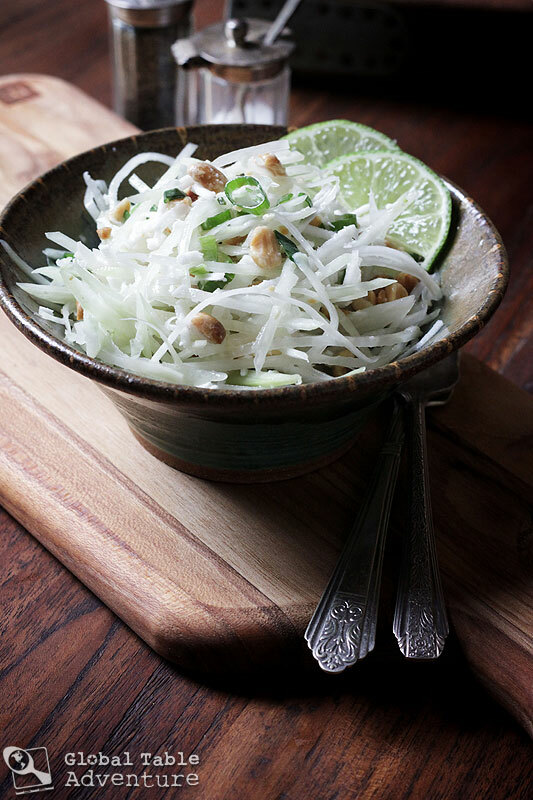 Green papaya crunches like carrot, but tastes mild like a cucumber. 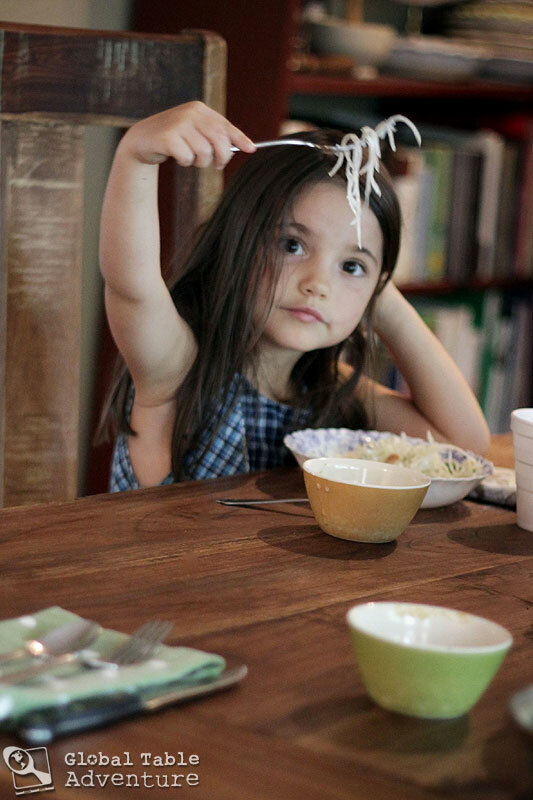 If you can make your way to a large Asian market, you’ll probably be able to find some perfectly pre-shredded for you. 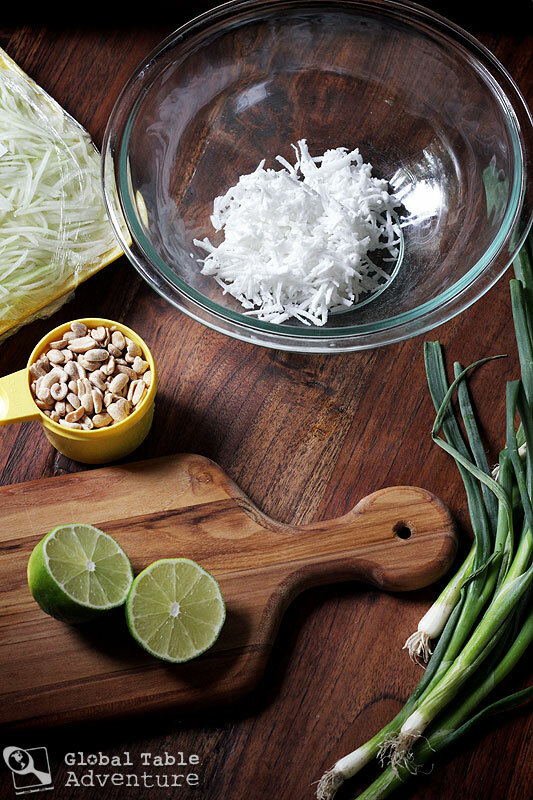 While there, grab a bag of frozen grated coconut. Moist and naturally sweet, it tastes completely different from the dry papery shreds we find in the baking aisle. With those two purchases, there’s hardly anything left to do. Inspired by a recipe in the World Cookbook for Students. Toss all ingredients together in a large bowl. Season with salt and pepper, as desired. Make sure to use lots of salt, to balance out the lime juice. 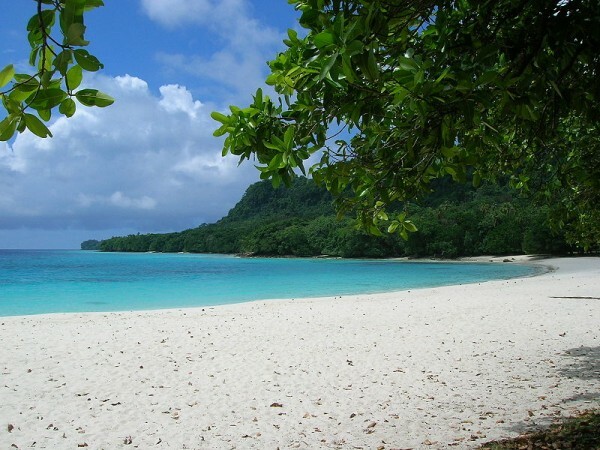 Enjoy somewhere light and fresh and bubbly… somewhere like Champagne Beach in Vanuatu. Champagne Beach, North Santo in Vanuatu. Photo by Jae Lee. Toss all ingredients together in a large bowl. Season with salt and pepper, as desired. Make sure to use lots of salt, to balance out the lime juice. I think this is how inspiration ‘happens’: ” • As the old saying goes, “A watched pot never boils,” so stop waiting for inspiration to strike or trying to force it. • Human brain is a marvelous multi-tasking machine, so go do something else. • The trick is to record inspiration as soon as they pop up, so you don’t forget them. Carry a notebook with pen attached *and* TAPE RECORDER at all times for recording marvelous ideas and thoughts that will seem to appear from no where… but, were inspired by something being seen or watched or heard or read or through conversation with another, or listening to other conversations etc. etc. Because ‘inspiration is alive and well and’ is all around us 24/7. Thankfully my phone has a built in recorder that I’ve used several times when lightening strikes. The trick is to remember to go back and listen to what I’ve recorded! 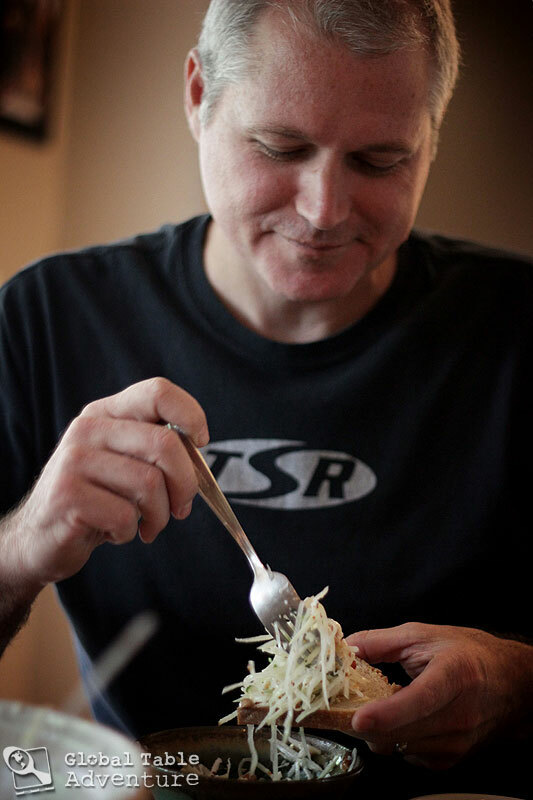 Unbelievably, this salad looks inviting right now…crisp and clean and sparkling…and healthy..
What is KeithAlan doing…putting it in a pocket bread? Crisp is exactly right. He was putting on a piece of toast. I don’t know why haha. Oh how simply wonderful to be transported back to Champagne Bay and the wonder of Vanuatu.